Greetings to you in Christ name. Hope all is well with you. I have been busy with the Youth Rally & Graduation Exercise at Skinner's Garden Bible School, which we had right after the Master and Short classes were over at Visakha Valley Bible College, from the 5th to the 7th. After this I had to spend time with my family because my wife needs me to take care of the third child. Right after this my older daughter was diagnosed with pneumonia, so I spent time taking her to the doctor every couple of days for different tests and checking. She is not yet recovered. She will be going to see the doctor today. Last week we had a campaign week (door knocking- tract distribution, holding personal Bible studies & Gospel meetings) in 5 different villages. As a result we witnessed 10 people baptized in this week. At Skinner's Garden we are having the power cut for 7 hours (working) each day. My computer lost its battery, because I need power to use my laptop. Finally, I found some time to wrap up the things that happened last month and report to you and the elders. Thank you for your patience. I hope you had a good visit to Chandigarh do hope it is beneficial. It would be wonderful if you can be here for the upcoming graduation of the first Master Class. We had another excellent two weeks of Master Classes at Viskaha Valley Bible College. Brother Jerry has done teaching for two weeks with the Master Class students. Even though this is his first time to teach the Master class students, he never felt uncomfortable, rather he got to know the students very well and has done a fantastic job in finishing the classes. While the classes were going on, we had to spend some time talking about the school academic procedure. Jerry wanted to know how the scores are being kept and what kind of teaching procedure we are using and when does the certain semester or quarter end. It was really a good time for us to explain the plan for the 2 years and who is teaching what. I have shown our agenda for all the faculty meetings we held so far. In all the meetings we discuss where we are and how things are going. That will help us be on the same page as well as help us to finish teaching at the appropriate time. We have shown the grade sheets that show the grades of each student who attended certain classes. Brother Greg had a hard time adjusting to the warm weather even though he spent quite a few years. Due to his health conditions he had difficulty in adjusting with the warm weather. Besides this, the weather was terrible, also you know how that heat adds up much in a city like Visakhapatnam because this city largely populated with industries. I myself have enjoyed translating for Greg. We both felt comfortable working together. This has been a good time of learning. You know what, the translator is the first learner in the class room. I was blessed to translate for Greg. I enjoyed learning new ideas in studying the book of Acts. Brother Greg taught The Scheme of Redemption in the second week of his stay, using a power point presentation. Students have learned so much through this kind of teaching. Of course it took a little longer than we thought because the students wanted to take down all the slides in to their class notes. Since we do not have a screen to display from the projector we used our wall as the screen. Thank goodness brother Greg brought his own projector with him. It would be great if we have a projector for our school. I have gathered so much material from brother Greg which will be useful to teach certain subjects using power point. It needs a projector as well. We pray that our Lord provides. I was gone for a day to visit with my wife who was expecting a child and admitted in the hospital. During that time, the Director of the school, Samuel Raju, filled in for me. I am thankful to him. 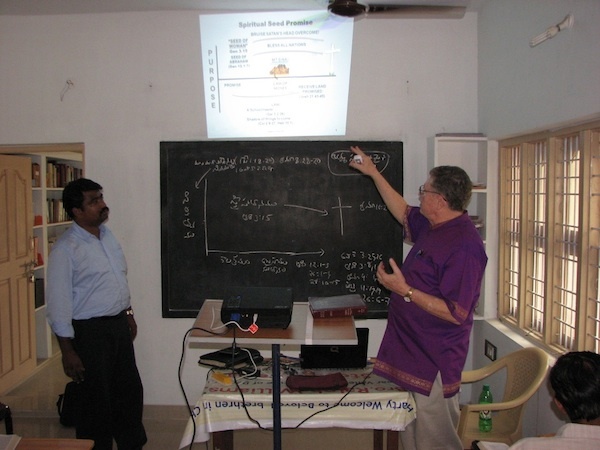 Brother Greg enjoyed his stay at Visakhapatnam and enjoyed his students as well. He is interested in coming again to teach classes. They arrived on Saturday, unfortunately Greg lost his luggage. After a waiting for couple of days he had his baggage delivered safely. The following day, Sunday, we worshipped with the congregation that meets at the school. One of the graduates of the school is helping in preaching. After the preaching was over, when the invitation is offered, the preacher’s son came forward to accept Jesus as the Lord. While these classes are going on, over the weekend we travelled to Skinner’s Garden. 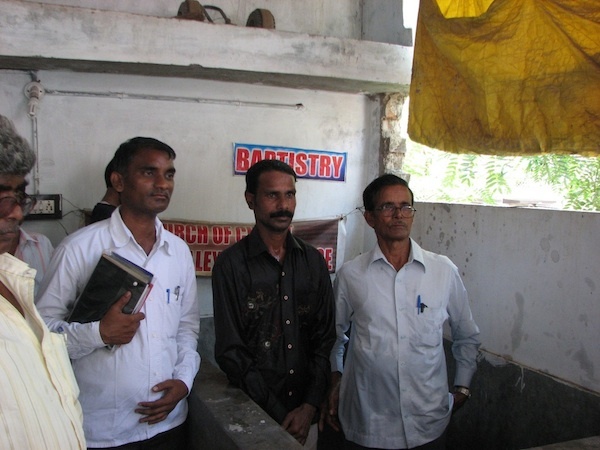 On our way we stopped by Kakinada where Jerry and Paul stayed with brother Joshua Gootam. This was Greg’s first ever visit to Skinner’s Garden. On Sunday he preached at Bikkavolu. On our way home we stopped by Pydikonda Village to preach at a gospel meeting. 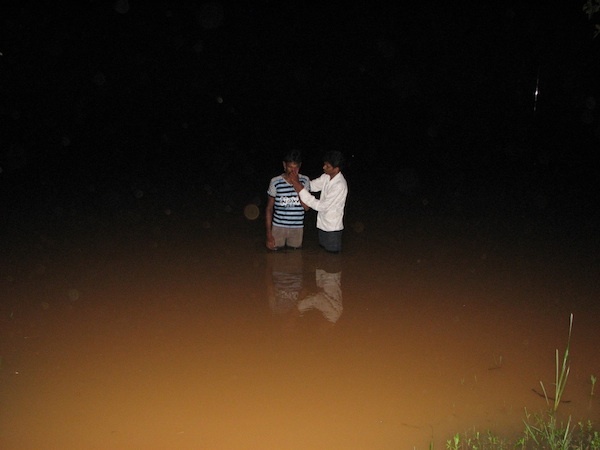 One young man came forward to be baptized. 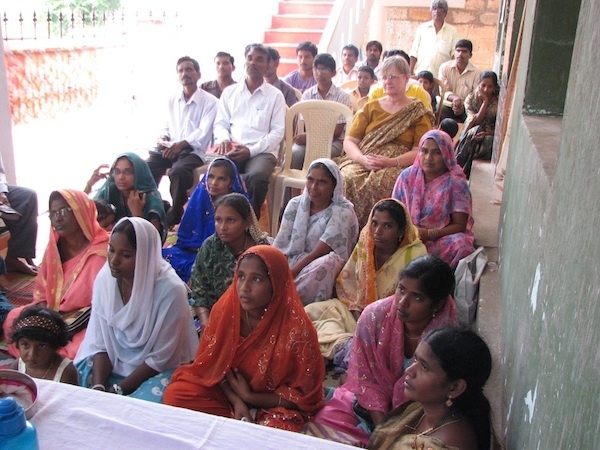 In evangelism, distributing Bibles is a great help for the local congregations. This helps the congregation to study the word and to examine the false doctrine. We know God’s word is two edged sword. We are thankful to brother Jerry & Paula Bates for providing money for buying the Bibles. They are indeed a greatly needed here. We received the Bibles that we placed the order for. I have reported in my previous e-mail that we placed the order for Bibles. We shall be using them among our students and graduates that are working in Visakhapatnam area. Right now there is a big scarcity for Telugu Bibles. That is why it is taking a long time to get the ordered Bibles. 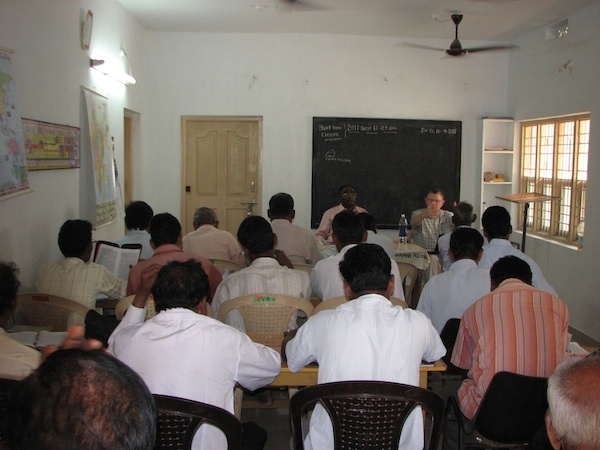 By the way, sister Connie Barden, who works with World Bible School, has done a favor after seeing our report on our website: /extension-news/tag/visakhapatnam, We thank you brother Bob for letting all the brethren know what is going on at the extension school. I do appreciate sister Connie Barden, who was instrumental in sending English Bibles to be distributed to the students that are going to school, also to those are need of English Bibles. It is amazing to see how God works wonderfully. In less than a month, from when I heard from her about her ordering Bibles, we received them. We are thankful to the brethren at ‘World Bibles for Christ’ for their charity. We shall be going for a gospel campaign for two days on 18th and 19th of November. One of our graduates is working in a place called Baadam, Vijayanagaram District. On the 18th we shall have a preachers’ fellowship meeting in the morning and the rest of the day we do the door knocking campaign and night meeting. The next day we would continue doing door knocking. Our students and preachers working in this area are doing the Lord’s ministry in their capacity. This area really needs some trained young preachers who dedicate their life for His cause. The prevailing denominationalism in our part of India is a big threat for the truth that is being proclaimed. Instead of listening to what the word of God says, people are more inclined to personal views and testimonies. This is really driving the sound preachers crazy, so the door to door evangelism really makes a difference, because it gives an opportunity to sit with any interested person or family. Certainly our preachers need to be patient and have to teach in all meekness. We are looking forward for this great opportunity to spread the True word. Our new batch students are excited about this. Kindly pray that the lost souls will receive Jesus as their Lord and Savior. Students have taken the quarter end exam in the last week. They have been given with respective class notes as well as printed material along with useful handouts for all the subjects we are teaching. We are blessed to have a copying machine, which is an effective tool in providing the class study material to all the students. A brother from Tennessee, who is working at Leoma Church of Christ, wants to come and teach a subject from the curriculum. His name is Willy Hamblin. He is a missionary to India as well, but never visited our school, neither Skinner’s Garden. What is the procedure to let him come and teach a short course? I know he is a good teacher and doctrinally sound. I recently heard about Brother Louis Rushmore from World Evangelism. I heard that he does an excellent job in teaching Bible Archeology & Geography. He visits India every year, visiting us for the second time as well. He usually visits in the month of October. If everything is alright using him, he can probably spend a week teaching a short course. He usually stays for a week at Skinner’s Garden. Pray for our country’s economy situation. Due to a hike in fuel, cooking gas is hiking like anything. Believe it or not, in just this year there was hike on fuel prices 5 times. Relative effect is on vegetables, transportation, oils, milk and other grocery items. It is very difficult for a common to survive in this kind of situation. We are thankful to the brethren at Bear Valley especially to the elders who are overseeing the Bible School work. We do thank the brethren at Lake Houston Church of Christ for their charity with which we are producing preachers to strive for His in this country of lost millions. Indeed training young men of their own community certainly giving great results. We look forward to work together many more years to come. Convey our greetings to your family and to the brethren at Bear Valley and Lake Houston. Thank you very much for your patience. Posted on November 5, 2011 by Bob Turner and tagged visakhapatnam.